Author(s): Michalis Mastri, Spencer Rosario, Amanda Tracz, Robin E. Frink, Rolf A. Brekken, John M. L. Ebos. Department of Cancer Genetics and Medicine, Roswell Park Cancer Institute, Elm & Carlton Streets, Buffalo, NY 142631, USA. Drug resistance remains an ongoing challenge for the majority of patients treated with inhibitors of the vascular endothelial growth factor (VEGF) pathway, a key regulator of tumor angiogenesis. Preclinical models have played a significant role in identifying multiple complex mechanisms of antiangiogenic treatment failure. Yet questions remain about the optimal methodology to study resistance that may assist in making clinically relevant choices about alternative or combination treatment strategies. 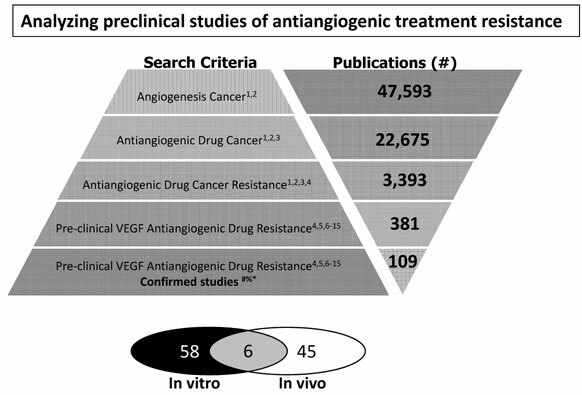 The origins of antiangiogenic treatment failure may stem from the tumor vasculature, the tumor itself, or both together, and preclinical methods that define resistance are diverse and rarely compared. We performed a literature search of the preclinical methodologies used to examine resistance to VEGF pathway inhibitors and identified 109 papers from more than 400 that use treatment failure as the starting point for mechanistic study. We found that definitions of resistance are broad and inconsistent, involve only a small number of reagents, and derive mostly from in vitro and in vivo methodologies that often do not represent clinically relevant disease stages or progression. Together, this literature analysis highlights the challenges of studying inhibitors of the tumor microenvironment in the preclinical setting and the need for improved methodology to assist in qualifying (and quantifying) treatment failure to identify mechanisms that will help predict alternative strategies in patients. Keywords: VEGF, drug resistance, metastasis, mouse models, GEMMs, syngeneic, orthotopic. Affiliation:Department of Cancer Genetics and Medicine, Roswell Park Cancer Institute, Elm & Carlton Streets, Buffalo, NY 142631, USA. Keywords:VEGF, drug resistance, metastasis, mouse models, GEMMs, syngeneic, orthotopic. Abstract:Drug resistance remains an ongoing challenge for the majority of patients treated with inhibitors of the vascular endothelial growth factor (VEGF) pathway, a key regulator of tumor angiogenesis. Preclinical models have played a significant role in identifying multiple complex mechanisms of antiangiogenic treatment failure. Yet questions remain about the optimal methodology to study resistance that may assist in making clinically relevant choices about alternative or combination treatment strategies. The origins of antiangiogenic treatment failure may stem from the tumor vasculature, the tumor itself, or both together, and preclinical methods that define resistance are diverse and rarely compared. We performed a literature search of the preclinical methodologies used to examine resistance to VEGF pathway inhibitors and identified 109 papers from more than 400 that use treatment failure as the starting point for mechanistic study. We found that definitions of resistance are broad and inconsistent, involve only a small number of reagents, and derive mostly from in vitro and in vivo methodologies that often do not represent clinically relevant disease stages or progression. Together, this literature analysis highlights the challenges of studying inhibitors of the tumor microenvironment in the preclinical setting and the need for improved methodology to assist in qualifying (and quantifying) treatment failure to identify mechanisms that will help predict alternative strategies in patients.